The MRWA was awarded a grant from the National Fish and Wildlife Foundation to restore instream coldwater habitat and help mitigate alterations within the Cedar Creek corridor that have occurred due to human and natural impacts. Matching funds were contributed by the Great Lakes Fishery Trust, Muskegon Conservation District and Muskegon Sport Fishing Association. The Muskegon Conservation District has been contracted to complete the work. The work was completed in 2013. The MRWA was awarded a grant from the Michigan Department of Natural Resources to protect and restore the natural hydrologic functions of Cedar Creek and to establish and help implement storm water standards and control practices that will retain natural habitat in all areas of the watershed. The MRWA will contribute an additional $15,000 toward this project. Fishbeck, Thompson, Carr & Huber, Inc. were contracted to complete the work. 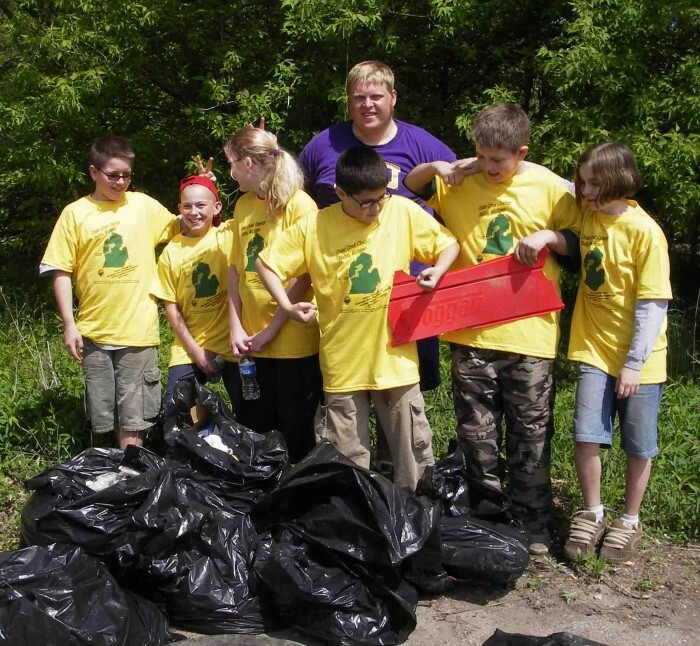 Holton Township, in partnership with the MRWA, was awarded a Michigan Volunteer River, Stream and Creek Cleanup Program grant to conduct a volunteer cleanup in the Holton area. The cleanup was held on May 17, 2008. Because the creek in this area has very steep banks and there were large pieces of trash in the creek, Holton Township had to hire people to take collect and discard these pieces of trash. Overall, volunteers (pictured below) and employees cleaned approximately one mile of creek collecting ten cubic yards of trash. The National Forest Foundation has awarded the MRWA and Muskegon Conservation District grant monies for stream habitat improvements on Cedar Creek in Muskegon County. Implementation recommendations from the Cedar Creek Habitat Assessment and Improvement Plan will be used to install woody structures and shoreline stabilization structures affecting 5,770 feet of stream. Structures were installed in the spring and summer of 2007 and the project is now complete. Consumers Energy/DNRE Habitat Improvement Account awarded the MRWA with almost $75,000 to develop stream protection criteria and recommendations for stormwater retention/detention by sub-basin. The MRWA Board allocated $15,000 toward this project. Fishbeck, Thompson, Carr & Huber, Inc. is conducting field work and analysis.